Derek B. Gayle reviews the second installment of Community’s three-episode finale from May 17. Derek B. Gayle reviews the first installment of Community’s three-episode finale from May 17. 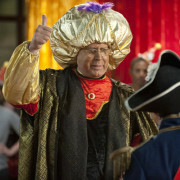 Derek B. Gayle reviews the May 10 episode of NBC’s Community. Derek B. Gayle reviews the May 3 episode of NBC’s Community.